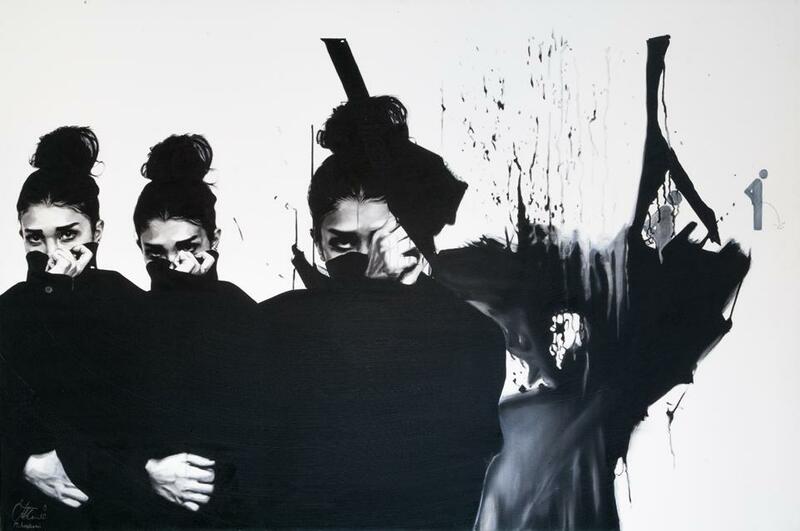 Last April, Bond Street’s Ayyam Gallery opened Afshin Pirhashemi’s first solo show in the UK, titled Seduction. 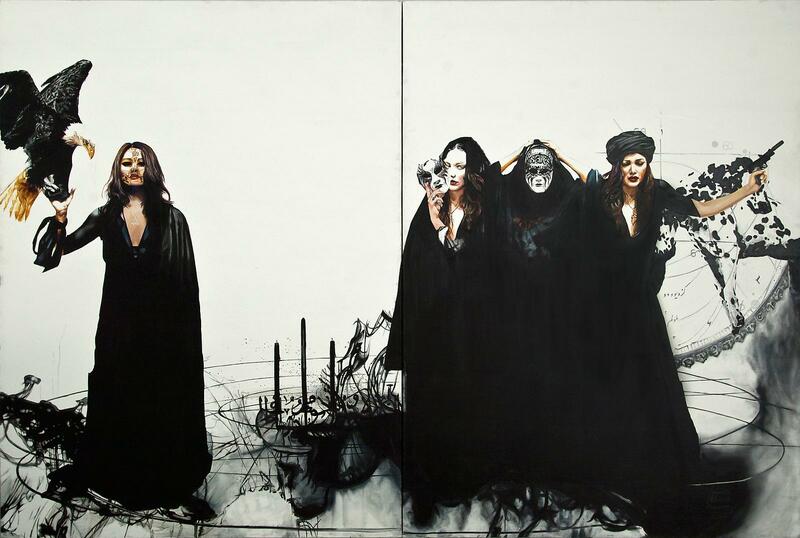 Looking at the Iranian artist’s latest paintings, one immediately comprehends the evolution in his work. His signature monochromatic, photo realistic pieces are charged with new elements. The inclusion of colors is one of them and breaks the monotonous black and white pattern seen in Pirhashemi’s work up until now. Next come the historical references, omnipresent in this show. 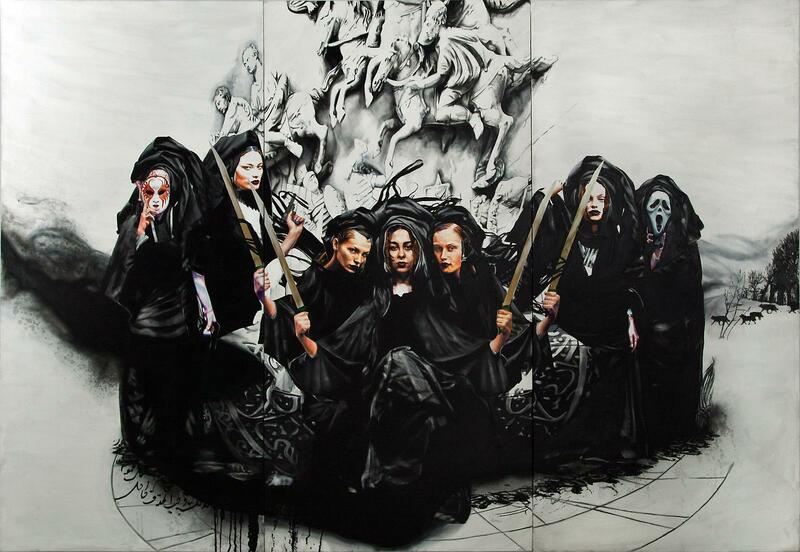 With quotes of Sufi poet Rumi on one hand and more western references such as “Scream” masks worn by the women, contrasts struggle from a canvas to another, embodying social and political oppressions of today. And yet the object of Pirhashemi’s work remains the same. Women. Piercingly menacing. No longer pointing guns like in last year’s show at Ayyam Gallery in Dubai’s DIFC, they acquire a subtly hostile personality, with wolves and eagles circling around them; live weapons looking for preys. Once again, Pirhashemi attains beautiful darkness. Disguising weakened characters under seductive veils, he provides them with weapons to protest against a society that has annihilated their rights. In an almost black and white world of oxymorons, Pirhashemi gives them power, a face and a voice.